As we emerged from Hiroshima station a man on a bicycle cut across in front of us, wobbled perilously, and sent a bag of leaflets fluttering across the station forecourt. He quickly dismounted and swooped down on them like a bird of prey, apologising profusely as we went over to help him. After we’d returned the leaflets to his bag we asked him for directions, and after pointing us towards the Peace Memorial Park, he disappeared again into the blur of morning commuters. We left the station and headed towards the river, and as we reached the A-bomb Dome a hesitant sun appeared above the skeletal roof, showcasing stark metal against blue skies. 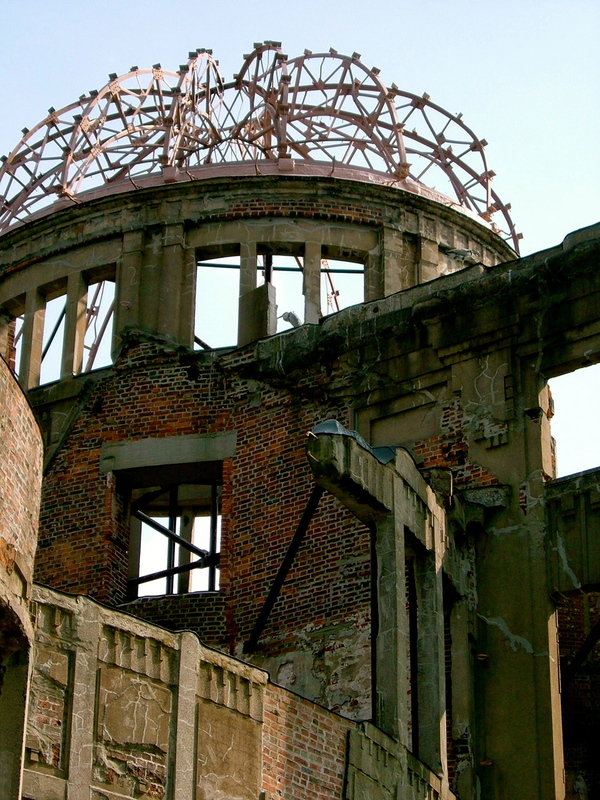 The building partly survived the 1945 atomic blast because of its position directly beneath the epicentre, and now the poignant ruin is frozen in time amidst high rise blocks. We stared in silence, listening to the chime of the peace bell across the water. At the park we were greeted by a flock of origami cranes. The strings of birds flew across the path in a gust of brisk autumnal wind, landing at our feet in a slalom of colour. I reached down and pocketed one that had broken free – tiny, bright and fragile, like an iridescent hummingbird. A group of schoolboys snatched up the strings and solemnly placed them around the Children’s Memorial, before politely cornering visitors to help with their school assignments. A serious-looking boy with a glossy fringe greeted us in English before holding up his question, carefully handwritten in neat, rounded letters. He wanted us to suggest what the world could do to achieve lasting peace. Thrown by his unwavering gaze, I scribbled a quick answer, knowing that whatever words I offered they would not be adequate. In front of us, a young girl and her mother arranged their own paper cranes around the memorial to Sadako Sasaki. Sadako was just two years old when the atom bomb fell, and died from leukaemia ten years later. She was attempting the challenge of folding a thousand cranes, the number needed according to Japanese lore to ensure that a wish comes true. 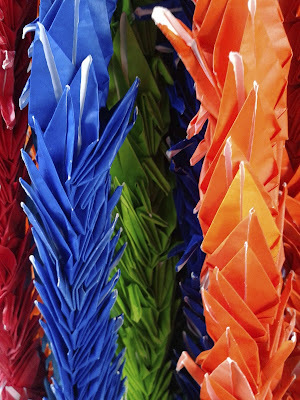 Since then countless birds have been folded by children all across Japan and sent here as a constant symbol of hope for world peace. I glimpsed a man watching us as he hung his cranes alongside the others. They were different to the birds folded from traditional origami paper; these were crafted from some kind of information leaflet, and when I saw them I realised it was the man from the station. As we turned towards the museum, I was aware that he was watching us as we went inside. As we walked from room to room, it was the simple personal objects and haunting snapshots that resonated the most. There was no doubt that these scattered fragments of ordinary lives spoke the loudest about what happened on 6th August 1945. There was a watch that had stopped at the moment the bomb fell, a twisted tricycle, the tattered remnants of children’s clothes, a wall streaked with black rain, a charred lunch tin, a bottle that had melted in the intense heat. And the dark shadow of a man, burnt onto the steps of the bank, where he had been sitting, waiting for it to open. When we stepped back outside, we blinked in the bright sunlight. The man was stood at the door, bowing to departing visitors as he handed out his leaflets. As soon as he saw us, he indicated a bench nearby and asked us to sit with him, finally introducing himself. Hitoshi was a local school English teacher, and a man with his own story to tell about Hiroshima; one that he wanted as many people as possible to hear. He explained that his mother, Mitsuko, was hibakusha -- a survivor of the bomb -- and consequently she suffered discrimination throughout her life, often finding it difficult to get work. A small child when the bomb fell, she lost her father and brother, and her mother and aunt suffered from severe radiation sickness and subsequent illnesses. After the war, misunderstanding was widespread, and survivors were thought to be bad luck and even contagious. 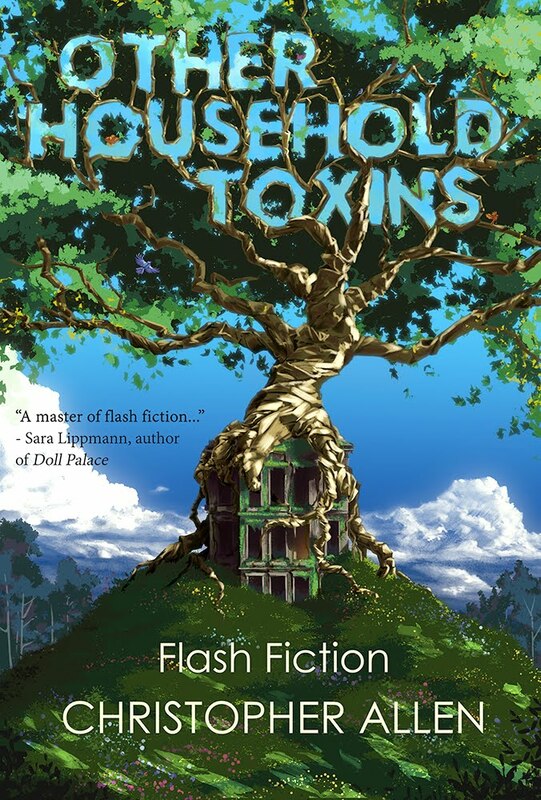 Hitoshi recalled the hostility from neighbours and the consequent need for them to move home several times. He remembered his childhood as a time of insecurity. He told us that he handed out leaflets to Japanese visitors and students in the hope they would understand their own history better through a personal story. As we said goodbye to him and left the park, we once again passed by the tangled strings of paper cranes around Sadako’s memorial. My hand closed around the tiny green bird in my pocket, and I paused for a moment to place my own hope for peace alongside the others. 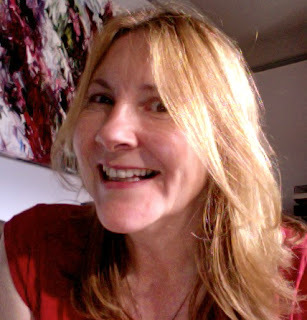 Mandy Huggins’s travel writing and short fiction has appeared in anthologies, newspapers and magazines. She has won numerous writing competitions and been shortlisted in many others, including those run by Bare Fiction, Fish, Ink Tears, English Pen, and Bradt Travel Guides. She won the BGTW New Travel Writer Award 2014. I chose Anonymous and was able to leave a comment immediately. This is one of my favourite entries so far. Such an important subject. Thank you. Beautifully written. A delicately and perfectly formed creation - like the origami cranes.